On April 1944 the Rudnerweider Gemeinde began to publish a conference paper to facilitate communication within its members and to promote home and foreign missions. 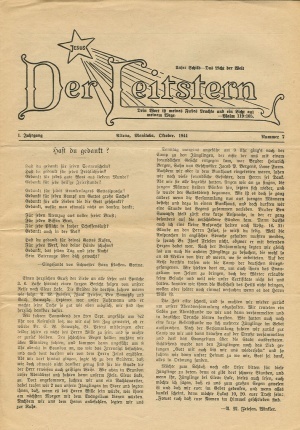 The title of this periodical was Jesus - Der Leitstern (Jesus, the Guiding Light), although the paper was commonly known simply as Der Leitstern. The publication was a monthly of four pages and 8 x 11 inches (20.2 x 29.1 cm.) in size. The annual subscription cost was 75 cents. The place of publication changed to suit the editors. It was Altona, Manitoba in the first year, then Winkler, and five years later Altona again. Der Leitstern contained many letters from male and female readers and articles that provided information on local church and community activities. As the official publication of the Rudnerweider Conference, Der Leitstern listed coming conference events, special meetings and festivals, and news from Bible schools and the wider Mennonite world. One important feature was the list of ministers and their preaching circuit which appeared four times per year. Occasionally Conference documents were published as inserts. Articles of a controversial nature were omitted from publication. Der Leitstern at first published only in German, but by the late 1950s there was considerable pressure to publish in English. To meet this demand an English-language youth page was added in 1957 and by 1962 the majority of the publication was in English. This mirrored the conflict and change in conference congregations they moved for German to English in church services and as the conference changed its structure and name. In 1959 the Rudnerweider Gremeinde was renamed the Evangelical Mennonite Mission Conference (EMMC). In 1964 an alternate-month schedule was implemented with the November issue published entirely in English under a new title—the EMMC Recorder. With fewer readers using German the last issue of Der Leitstern was published on April 1967. Editors of Der Leitstern were Peter P. Zacharias, 1944-1949; Cornelius Bergen, June 1949-June 1954; Gerhard Penner, July 1954-December 1955 and February-September 1959; Edwin Klippenstein, January 1956-May 1957; Jake Giesbrecht, June 1957-January 1959; Andrew Heinrichs, 1959-1964; and Frank Zacharias, 1964-1967. Heppner, Jack. Search for Renewal: The Story of the Rudnerweider/EMMC 1937-1987. Winnipeg, Manitoba, 1987. Wiebe, Victor. "Der Leitstern (Periodical)." Global Anabaptist Mennonite Encyclopedia Online. 2006. Web. 25 Apr 2019. http://gameo.org/index.php?title=Der_Leitstern_(Periodical)&oldid=123049. Wiebe, Victor. (2006). Der Leitstern (Periodical). Global Anabaptist Mennonite Encyclopedia Online. Retrieved 25 April 2019, from http://gameo.org/index.php?title=Der_Leitstern_(Periodical)&oldid=123049. This page was last modified on 10 June 2014, at 15:04.